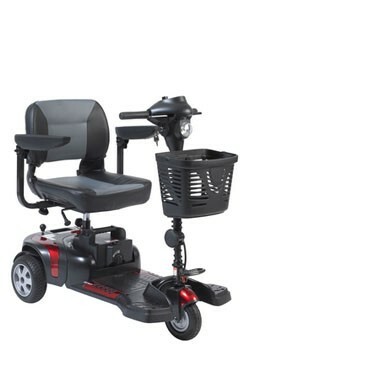 If you're seeking a user-friendly, transportable mobility scooter that can also accommodate a weight capacity greater than 300 pounds, the Drive Medical Phoenix HD 3 is the right choice for you. The Phoenix HD 3 has the highest weight capacity in the market for travel scooters and combines easy portability with a 350 pound weight capacity to accommodate a greater variety of users. Durably made by Drive Mobility, it provides users with great indoor and outdoor mobility, so they can remain independent and enjoy their favorite activities. The Phoenix HD 3 has a three-wheel configuration that provides excellent maneuverability in tight spaces such as store aisles or cramped indoor areas. The lightweight design makes it a convenient option to take with you on the go. Whether you travel into town to run errands or go on a weekend excursion, this Phoenix 3 scooter couldn't be easier to disassemble. It can be taken apart quickly and easily into five easy-to-handle pieces for loading into a car, truck or van. Assembling it is just as hassle free and can be done in just a couple of minutes. The Phoenix HD offers great features which include color change panels in red and blue, and an ergonomic —finger-pull" throttle control to make operating the scooter a breeze even if you experience limited strength or dexterity in your hands and fingers. The Phoenix HD also includes a headlight for enhanced safety and solid, flat-free tires for worry-free use. The comfortable stadium-style seat is covered in stylish two-tone upholstery and offers three height adjustments. The seat also swivels 180 degrees for easier boarding and exiting. You can also adjust the width of armrests as well as the angle of the tiller. The Phoenix HD also provides great performance with its 4 mph top speed and 15 mile maximum cruising range. Charging the battery is simple; you can either charge it from the port on the control panel or the battery pack. Go ahead, experience the Drive difference. Floor to Seat Height: 20.00"-22.00"